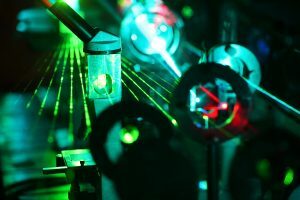 Similar to fiber optic, FSO links use lasers for data transmission, but instead of enclosing the data stream in a fiber, it is transmitted through the atmosphere. The transmitter side typically consists of a laser diode, a modulator, an optical amplifier, and beamforming optics. Data bits from the information source are first modulated. The modulated laser beam is then passed through the optical amplifier to boost the optical intensity. The light beam is collected and refocused by means of beam forming optics before being transmitted. The receiver side consists of optical filters and a lens followed by a photodiode. The optical front-end collects and focuses the received beam onto the photodiode. The photodiode detects changes in the light intensity and recovers the data.